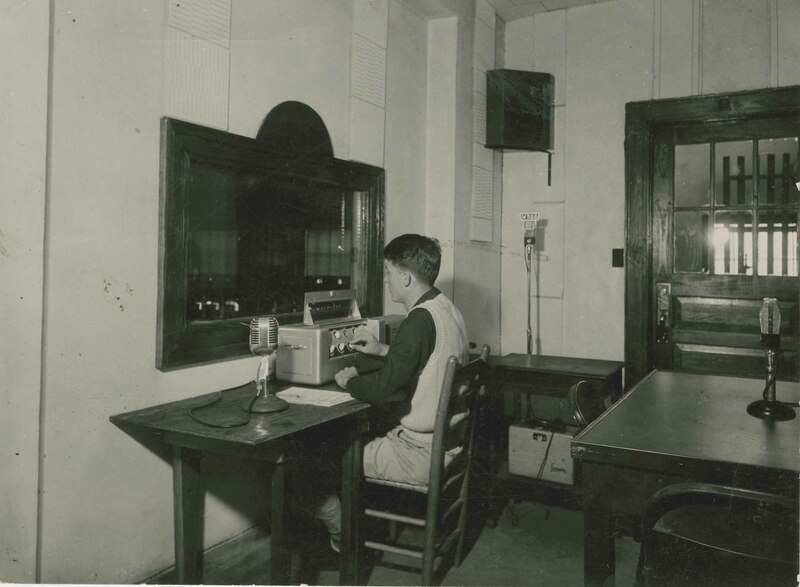 Radio room in Whitley, 1948. If you’re old enough to remember a time with no TV, no internet, no Nook or Blackberry, then you will remember the radio. The family gathered around that early entertainment center and listened to “The Jack Benny Show” or “One Man’s Family” or “Your Hit Parade” and thought themselves lucky to have a radio in their home. By 1947, Elon had completed a radio broadcasting studio in Whitley auditorium on the second floor facing the stage and was ready to launch the Elon Radio Players over WBBB, the Burlington, N.C. station that would carry the plays. The room, the wiring, and installation of equipment was done by Professor A.L. Hook and students from his physics classes. The first show was pretty challenging – “Jane Eyre.” The 30-minute show was cast, produced and directed by members of the cast as part of their final examination. All went well, so they planned the next productions. The idea for the Radio Players came from Mrs. Elizabeth Riddick Smith, Assistant Professor of Dramatic Arts, who, by the way, was the daughter-in-law of Dr. Leon Edgar Smith, the President of Elon College (1931-1957). After “Jane Eyre” came “The Phantom,” a suspense drama handled ably by the students of Mrs. Smith’s Advance Radio Class. The broadcast had a director, a narrator, a music supervisor, and a student handling sound effects. In all, three plays were presented over WBBB and then the Elon Radio Players faded away like the sound from the old radios. This entry was posted in Academics, Student Life, Student organizations. Bookmark the permalink.